Youth Positive launch event Etihad Stadium 28th Feb 2013. 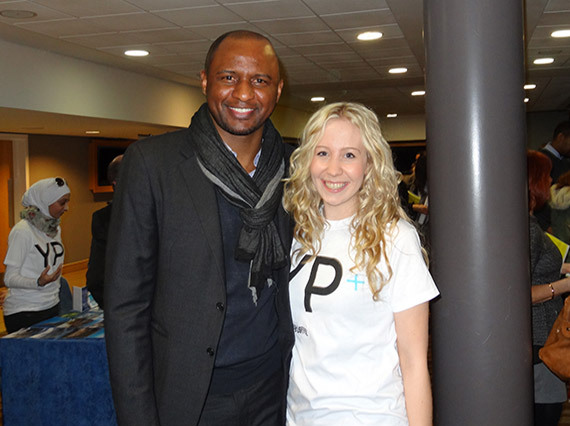 Meeting Patrick Vieira after performing my recital to open the launch of Youth Positive. This was a fantastic opportunity to promote the positive image of young people from Manchester and the surrounding areas. I was asked to perform five songs at Manchester City Football Club Etihad’s stadium on Thursday 28th February 2013 by Reclaim Our Name, at the launch of their Youth Positive charity initiative, in association with CITC (Manchester City in the Community). I have been a lifelong Manchester City fan so singing Blue Moon at the club was such an added bonus to supporting a fantastic charitable event. I also got to listen and speak to Patrick Vieira, wow, what an honour. 4 responses to Youth Positive launch event Etihad Stadium 28th Feb 2013. I hope he got your autograph Charlotte, when your famous it will be an honour to meet you! Thank you very much Gilly for such a lovely comment. Patrick Vieira didn’t request my autograph but asked for a copy of the picture, so i shall take that as a compliment ;). Thank you for believing in me its lovely to have such nice support.